Where’s Eliot Spitzer when you really need him? Well, here’s another sure sign of a recession: Nevada’s legal bordello business is down 25 to 45 percent. George Flint, director of the Nevada Brothel Owners’ Association (and how does one get that gig, this blogger would like to know?) credits skyrocketing diesel fuel prices for the ‘business interruptus’, if you will. Truckers are the big (ouch!) 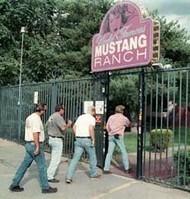 customers of places like the Wild Horse Adult Spa and Mustang Ranch. But, you can’t get there from here with diesel going for $4.50 a gallon. So, here’s my solution. Put Eliot Spitzer back to work. Send him to Nevada as a goodwill ambassador. Maybe he publishes a Zagat’s style guide for patrons? What brothel wouldn’t want a ‘five Spitz’ rating? Or, how about the gov making personal appearances tied in to his upcoming blockbuster book, ‘I was client nine.’? Worst case scenario, Eliot ‘injects’ some much needed capital into the state’s flaccid economy by paying his usual $450 per hour (instead of rural Nevada’s going rate of $175 per). 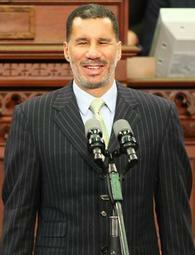 Mr. Flint, I KNOW Mr. Spitzer is the answer to your woes. Mr. Spitzer, why not put all that down time to good use? After all, idle hands are the devil’s workshop.